Immunoglobulins in serum, plasma, and other body fluids like saliva, are known as potential biomarkers for autoimmune and systemic complex disease such as inflammatory, ageing related and cancerous disease. It is also well known that changes in immunoglobulin-profiles against a broad variety of proteins (e.g. auto-antigens, tumor-autoantigens etc.) are an early event in disease and can be useful as diagnostic biomarkers. NXT-Dx has developed sero-reactivity profiling using high density protein and peptide array technologies. NXT-Dx offers innovative high throughput technologies using protein and peptide microarrays, multiplex protein-analyses (using Luminex and microtiter-plate based assays) and ELISA, as predefined and customized analysis services and assay development services. Including bioinformatics assistance and data analysis, we support our customers in the ultimate goal of defining immuno-assays and biomarkers for improving research and diagnostics. This array represents 7400 annotated human proteins derived from 15286 recombinant E. coli expression clones. It is an ideal tool for serological biomarker discovery. This array represents 172.000 peptides defined by IgG profiling of the big 4 human cancers (breast, colon, lung and prostate), including peptides deduced from common somatic mutations in cancer. This array contains over 2M proteins which represent the entire human proteome and the human virome. 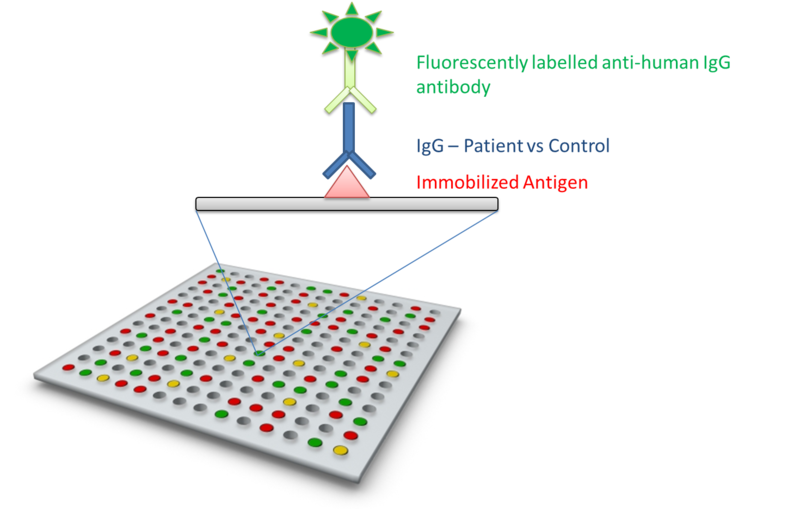 We can run any type of commercially available assay for ELISA and for the Luminex platform. 1) We can design customized high density tiling peptide arrays deducted from known protein sequences. 2) We can design targeted assays using Luminex bead arrays and Microarray in e.g. the wells of a 96 wellplate for parallel analysis of e.g. several proteins/peptides (10 to 500) per sample. Contact us for any of the above or for any help in defining the immunome, biomarker research, epitope mapping, defining peptides from proteins, defining chemically synthesizable linear peptides from protein-sequences, testing patient samples upon treatment for their immune-response, etc. We are very happy to discuss your particular project with you. Afin d’aider notre futur mariée à avoir un mariage splendide dans la plupart des belles en ligne, belle fait toute attention à chaque pas. Nous trions les robes en différents styles, couleurs, longueurs, tissus, saisons et occasions. Avec un si grand nombre de choix, vous serez rassuré de savoir ce que vous voulez le plus. Pour ceux qui ont du budget serré, faites vos achats de robes en diverses occasions ici, c’est de bénéficier d’un meilleur rapport qualité/prix. belle vous promet une bonne qualité de chaque article desrobes de mariée.